*An English Travel Writer*: Sunshine. I don't know if it is just me but it hasn't seemed like summer till now. Not only weeks on end of drab greyness, but the general angst, recriminations and arguments around the referendum also made everything seem grey. But now the sun has come out, and the Olympics are here (or, rather, in Rio) and the atmosphere is lighter. 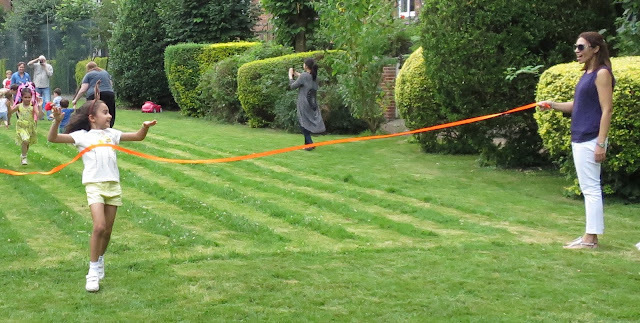 Our local housing co-op had its own Olympic Games and it was great for the kids that the adults turned out to organise them a relay, sprint and all the favourites like egg and spoon and sack race. We decided to do a couple of the things we'd been waiting for summer to do. One of them is to revisit Abbey Wood. It's now an unremarkable suburb in SE London, but in years gone past it was a hub of power, the site of Lesnes Abbey, whose monks once owned everything for miles around. They were closed down in the 16th century and the remains of their huge, grand abbey are being regenerated as part of a Heritage Lottery Scheme, A new turf roofed visitor centre is being built, as well as a new garden like the monks might (or frankly might not) have had. It has cast iron gates representing grass (I think) and rather odd sculptures which are supposed to represent beehives (I think). So not the easiest garden to interpret, so far. I've found a description of what it will ultimately be like (follow the link here),but the main thing is that it is an attractive place to be, which is what really matters in a garden. The monks' fish pond, previously overgrown, has been opened up for wildlife studies with a boardwalk, and generally the site is getting more of the attention it deserves. Just round the corner by those trees in the picture above, is a stupendous play area with a climbing wall, bike track, every imaginable sort of play equipment, an outdoor gym a parkour zone and goodness knows what else, and it was great to see lots of kids and families picknicking and playing. The woodland that stretches out from the abbey is very ancient, part of the great Wildwood which used to cover so much of the London area. Over 900 species of invertebrates, and 300 species of plants have been recorded here, and it has a fossil bed, ponds and some heathland too, plus quite a few butterflies I didn't recognise. Most of all it is a wonderful woodland to walk through and we stopped and chatted with quite a few people who come here every day, either to walk their dogs or to get a bit of peace and quiet. 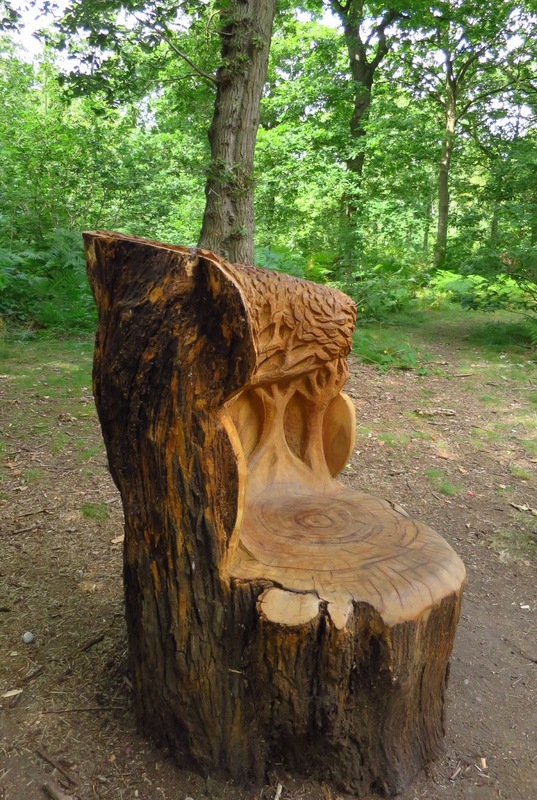 In a lonely glade, someone had carved my ideal chair from an old treetrunk. And very welcome it was after a few miles. There are several ponds. 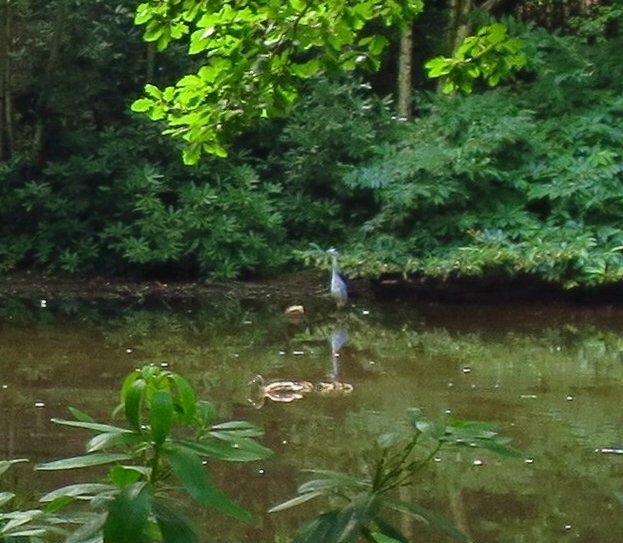 There's a heron in the background with a mother duck and her ducklings swimming. and plenty of blackberries, particularly delicious ones. Since the sunshine continued, we went a couple of days later to Wisley, in Surrey, the chief garden of the Royal Horticultural Society. We try to go a few times a year to see the garden change with the seasons. If you haven't been to WIsley, let me show you my house (in my dreams) Naturally there would be a team of Wisley horticulturalists standing by to look after the acres of grounds. And label all the plants.... like this one whose leaves look as if they are speckled by sunlight filtering in through the trees. Here was my favourite curiosity. It hardly looks like a flower at all. 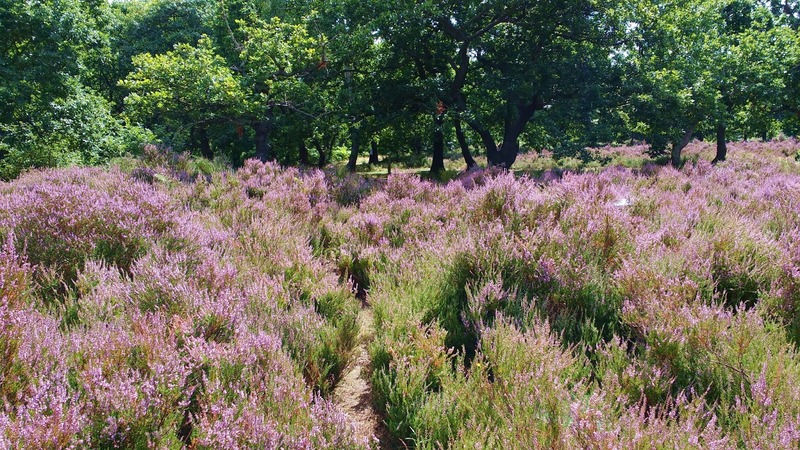 At this time of year, the wild areas come into their own. This part of the garden features plants which grow wild in the British Isles. So that's what I'm up to. Mostly, just enjoying hanging out in the summer and making the most of the sunshine. I hope you're enjoying your late summer too. That last picture especially got me. We have the exact same wild gladiolas in this yard here in Florida. They do not bloom as profusely due to lack of sunlight but they are the same. Always surprises me to see so many of the same flowers growing in places that are far apart! Your yard always looks so nice with all that is going on in it, the chickens etc. The participants were much more relaxed, for sure! They all won stickers, too, so there were no losers. What lovely woods - almost as wonderful as Savernake! 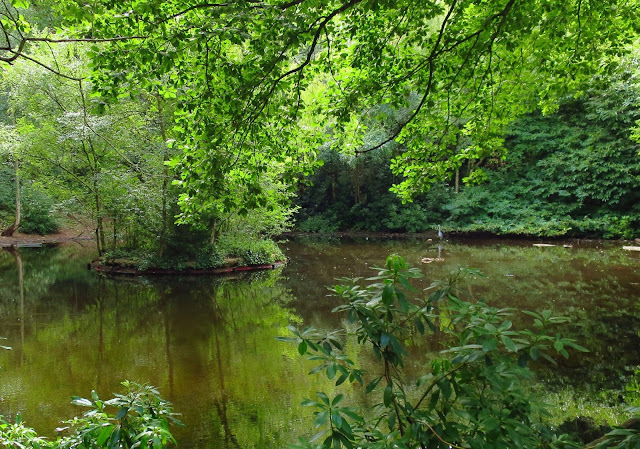 Savernake really is hard to beat. Beautiful pictures and thanks for sharing. We're finally getting some heat here in Portland, but I don't expect it to last. Wow! Both are gorgeous, but I love what they are doing to the old monastery! So glad to see things get the care and rebirth that they should. :) Have a great week. Glad to see you are taking advantage of this weather and getting into the gardens. The shot of the ancient trees makes me want to be there! Super colour. The trees are really great at this time of year, aren't they, I think it is all the rain we have been having so they don't look late summery and dusty like they so often do in late August. 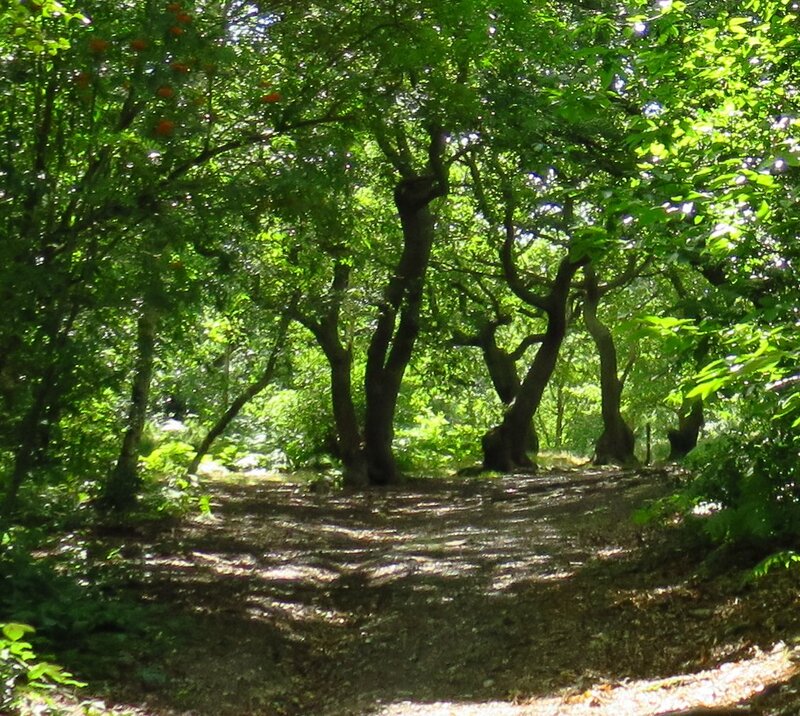 The wildwood in Abbey Wood is stunning. It seems a natural umbrella, too. It is great shelter from the sun, which really got quite hot at times. I am pleased you are taking full advantage of the beautiful weather and visiting these gardens. The carved chair is wonderful and I agree with your taste on your dream home. I would love to visit Wisley. I think you might find plenty to paint at Wisley. Although actually those woods were fantastic too. beautiful flowers and terrific wood carving. Send us some of your gray weather, please. Hasn't the warm weather been great? I've been outside gardening every day. Although my garden doesn't quite match up to the ones in your photos! I love the beehive sculptures and the chair carved out of the tree. Such a lovely summer to enjoy! It's not right to let summer slip past without some times of refreshment. I'm glad I've had the chance to get out, it has really been a poor summer so it's a privilege to have a few days off and enjoy it. Thank you for another splendid blog walk in the UK! I had to look up bee skep because as soon as I saw them in the garden photo above, I couldn't get bee keep out of my mind. :) There are few places I know of in America to be out and about in such lovely woods as you have over there. 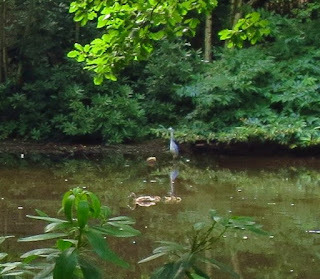 The shades of green in the blue heron photograph are a real delight. Thanks, Maywyn. The heron pond had a kind of a Japanese or oriental feel to it, I think it was the calm and reflection of the trees, and the little island in the middle of it. All of the photos are wonderful, as always. Two of them were especially intriguing - the cast iron grass gate and the chair made from a treetrunk. I'd like to have both of them in my yard. And, of course, I'd also love the blackberries. The idea of having a neighborhood summer Olympics is a good idea. I rather think it would be more interesting than the endless hours of volleyball that I've been seeing at the Rio games. Glad to hear that sunshine has finally appeared in your neck of the woods. Summer has been hot, humid, and extremely rainy here in Tennessee. Yes, the garden at Abbey Wood has lots of nice details. DIscovering the tree was a big surprise, though. Just came across it in the woods... I don't like humid and hot. We used to have that in Malta and even though I was a teenager I still noticed it was hard to deal with . It's even harder now I'm older. Oh yes my kind of house too. What a beautiful place to visit. Good to have your own Olympics. At least they would have been at a civilised time of day. I'll be glad when it's over & I can get to bed & actually sleep. You get so hyped up even though I'm tired I can't drift off. Last night it was Andy Murray, tonight it's Rajiv Ouseph in the badminton. Brilliant!!! Yes, our local olympics were over in time for tea! I have not watched the "real" ones at all. 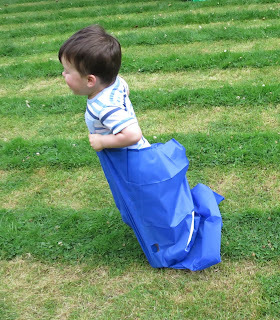 It is impossible to pull away once you've got involved, same with the Wimbledon tennis.... I don't really like sitting in front of the TV, I guess, but it is so complelling sometimes. Beautiful garden and the first one sounds like it's going to be a great place to visit. It already is nice but gardens always need a while to reach the way they are intended to look. I go back to the place occasionally and I've been watching it develop. The world needed the Olympics to divert our minds from the constant roar. They came at the right time and most of us are enjoying them. The happiness you see on the competitors faces is such an uplift. Your pictures are, as usual, interesting and also uplifting. I love the purple verbena. I am sorry that I didn't plant any this year. WOW, What a great post today filled with wonderful photos. I love the idea of your own Olympics ! What super walks you have taken us on - and even provided a lovey chair for me, how kind! It was quite appreciated after the walk, came across it in the woods almost at the end of the path, so very thoughtful of someone to carve it! Now that was a blast from the past for me, Jenny! In the early 1990s, I spent several holidays with friends who lived in Belvedere. Once I was there over the Christmas and New Year period. It was cold but sunny with brilliant blue skies that year, and we walked to Abbey Wood. It didn't look as nice as it does now in your pictures, but it certainly was a good few hours of being out in the fresh air. It has been "proper" summer for me all the time I've been in Yorkshire, and since I've come back here, too. Apparently, the weather is going to change here towards the end of this week, so I am trying to make the most of it while it lasts! I think you said once before about Belvedere, and it amused me because honestly most people even Londoners have never heard of Abbey Wood or Belvedere. They might as well be in Yorkshire they seem so remote but then London is an awfully parochial place. Five miles away and you might as well not exist, even in the same city! :) I think the weather has now turned but you should have got some great weather in since leaving your comment. Yes, summer finally arrived. But for how long, I wonder. It has been a strange year, weather-wise. A relaxing post, Jenny. Loved the photo of the 'strange' plant, and the tree chair. The wildlife section of my garden is rapidly being covered with Crocosmia, so colourful, so invasive. Lovely summery post... you always choose places I have never visited.. on my list. Have been to Wisley but not the others. Wisley is always worth a visit, as are the other RHS gardens. I think Wisley's the largest one. It does look lovely and Summery over there. I hope it continues for another few weeks, Jenny. I love your 'favourite curiousity' flower - it really is the maddest flower I have seen, and pretty as well! The treetrunk chair is beautiful - how wonderful that someone came and did that. Jenny, it's a treat to see your photos of Wisley, as I love this garden very much. And your house (in dream) is an old beautiful cottage, isn't it? Abbey Wood is very interesting and I decided to go there in my next visit to UK. There are some beautiful RHS gardens in England. Have you visited the one in Harlow Carr in Yorkshire? Mike (below) mentioned it. I have a kind of a project for visiting and revisiting all the UK's RHS and National Trust gardens in the UK, although in fact I often find that National Gardens Scheme gardens are as nice. What a wonderful, fun idea for the kiddies. Love it! I also am loving watching the Olympics. I'm an Olympics' Tragic, and will no doubt go through withdrawals once it's all over. I've been watching as much of the Games as I possibly can...and that's a lot! I purposely put myself into hibernation over these two weeks or so. Great photos of those lusciously green, shady woods! That tree trunk chair looks so inviting, I bet a lot of people sit down and pose for a picture while sitting in it. I know I would! So, how many of the blackberries did you eat? Oh, ate just loads. They were specially nice ones so could be eaten just as they were, we picked some to take home. Other wild blackberries might be less juicy or more sour and I always use them in a crumble with bramley apples that go soft and mushy ... gives me such a thrill to pick em too, even though I usually get caught by the thorns. As always a splendid ramble through your experiences. I wandered over and had a read about Lesnes Abbey. Perhaps I should have paid more attention to history at school. 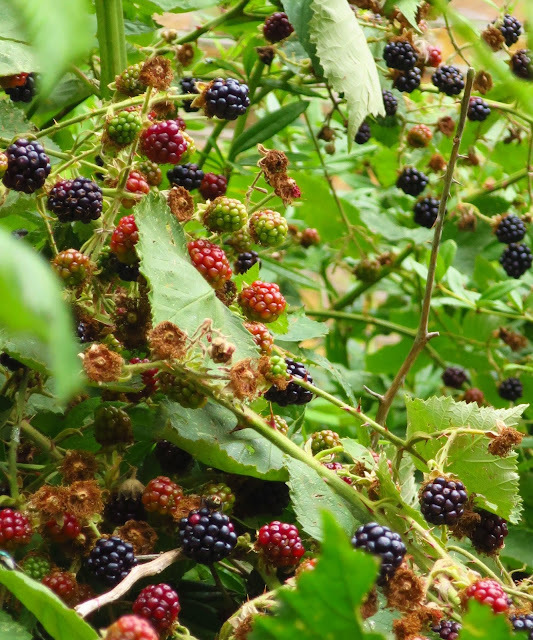 I walked along a towpath near Glasgow last week and the blackberries there were just getting ready to ripen and I'm sure there would be a lot of people enjoying them by now. The carved chair is lovely and it's one of those arts or crafts which seems to be welcomingly blossoming at the moment just about everywhere (particularly in New Zealand). My memory for flowers is so poor that I have to label them in my own garden. However the thing that attracted me to the woodland most was your mention of all the butterflies. I'd love to walk there with my brother to tell me what they are. I really wished a butterfly expert had been with us in Kent. The butterflies there were even more amazing, and some I hadn't seen before - although it has to be said I'm not madly observant about the details of butterflies as they've always flown away before I have the chance to examine them closely! I love the tree-trunk chair. It looks very comfortable, unlike a lot of more modern and fashionable chairs! And I love the beehive sculptures. I imagined removable tops and small children hiding inside! That pink flower is extraordinary - it looks distinctly tropical. Yes, it was tropical - it was in the greenhouse. I think it might have been some kind of an orchid. They have some of the weirdest flowers I know. To me it looked oddly like a present that had been gift wrapped. I had to do a double take to make sure it was actually a flower! Wonderful pictures, Jenny. Two places I don't know, both of which I want to visit. Lesnes Abbey looks even more attractive than photos I had previously seen (though of course I collect visits, attractive or otherwise!) and, believe it or not, I used to pass Wisley very often, travelling up and down the A3, but have never had a decent look round. We visited RHS Harlow Carr last weekend - it was stunning. PS Love the idea of the kids' Olympics. I shall keep my comment brief. Difficult to concentrate. Let me just say that, as per usual, your photos are superb. We often seem to get a hint of summer in mid-August. Those kids, future Olympians. Have a wonderful, hopefully sunny weekend. Thanks so much for taking the trouble to reply Gary and I appreciate your comment. I think I would like the kids to enjoy sport rather than be Olympians, it always seems such a tough and stressful life being a professional sportsperson although to be fair they seem to enjoy it. Wow, wow, wow, wow. Love the green photos. And that second shot with the kid. That's fantastic fun. That pinkish flower thingie is really interesting. I don't think I've ever seen one like that before. Another great post, Jenny. You always find something fascinating to perk our interest. I've been several times to Wisley but not Lesnes, so another item for the bucket list. I love the "Olympic" games. I'm glad to see that you are finally getting a summer. It seems that our summer is always too short too. That is an enchanting garden. I love the purple flowers, but don't bother telling me their name because I don't seem to be very good at remembering plant names. :-) I love the photos of the children playing; it's not easy to capture such dynamic poses. The abbey grounds are so beautiful -- I like the gates a lot. Quite beautiful and your photos are terrific. I'm especially fond of one of the pond images. I could walk right in! I think you are having the summer we had a year ago. This year is is simply four-star every day, although there has been a bit of a drought, but that's leveling off a bit. I'm glad the weather finally broke for you. You managed to get a lot out of your couple of summer days. I enjoyed seeing nature at work in your area. It is always a pleasure to know that an area is being restored - even if not in its exact original form. I also like those iron gates. Well done ! I'm a firm believer in enjoying the results of other peoples gardening , too . Gorgeous place and photos, Jenny! I'm glad summer has reached you too! Love the photos of kids having fun! And such a gorgeous place.